If you thought that the practice of companies re-drawing art without the permission or knowledge of the credited artist stopped in the 1970s then you'd be wrong. It's well known that Murphy Anderson and Al Plastino routinely re-drew the heads of Superman and Jimmy Olsen on Jack Kirby's Fourth World run to keep it in line with their corporate style, John Romita used to do the same at Marvel Comics from the 1960s through to the late 1980s. It's a practice that has annoyed artists for years as the majority of artists never had a clue about art alterations until the book was published and they saw the finished product, and it has been the source of both frustration and a refusal to work for particular companies. 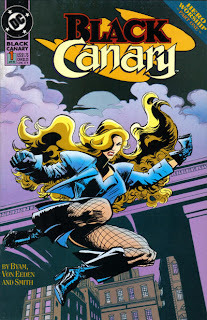 Thus it should come as no great surprise when Trevor Von Eeden explains the real reasons why he now disowns the art for at least two issues of Black Canary.